Since I’ve decided not to cover any compilation or best of albums on this blog, I almost did not review today’s subject. My reason being that Cactus Revisited is a collection of six songs remixed from 3rd Bass’ debut The Cactus Album (or The Cactus Cee-Dee, depending on which media format you purchased) and one previous unreleased song. 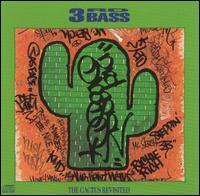 But at this point 3rd Bass had only released one album, so it definitely not a “best of” album and there is at least on new song included I decided to take the Cactus Revisited for another spin. The Cactus Revisited was released a year after the original and six months before their second and final group effort Derelicts of Dialect , in what I can only imagine was a way to keep listeners interested in the mean and in between time of their official releases. Some pretty well-respected producers dropped off beats for our melanin challenged brethren, but even with their contributions Cactus Revisited received lackluster results, both commercially and critically. I haven’t listened to this album in years and even looking at the track list on the cd insert I can’t remember what any of the remixes sound like. Which might be me foreshadowing my opinion of this album, unknowingly. The Gas Face – Since it would probably be nearly impossible to surpass the sickness that was the original instrumental for “Gas Face”, 3rd Bass wisely uses the same Prince Paul instrumental but use different lyrics on this take. Pete sticks to the same playground antics as the original while Serch take a more serious approach to his content. Zex Love X (better know as MF Doom) doesn’t appear on the remix but it would have been interesting to hear what he would have to say on this remix. This wasn’t life changing, but is was a cool spin on the original. The Cactus – Dave Dorrell provides a decent instrumental for this remix. I personally prefer Sam Sever’s instrumental on the original, but if you disagree I’ll understand. Wordz Of Wizdom – Other than a missing guitar riff and a minor tweak here and there, this sounds pretty much identical to the original (which Sam Sever is also responsible for). It’s nearly 8 minute run time is waaaay to long! I’m not sure why they thought a remix was necessary for this one, but I prefer the original. 3 Strikes 5000 (Vocal) – This is the lone song that was not included on The Cactus Album . After listening to the Stimulated Dummies skeleton instrumental it was probably a good idea not to include this on the original release as it sounds incomplete (which might explain the “vocal” in song’s title). To add insult to injury both emcees sound like they’re struggling to gain their footing to the beat, with Serch sounding more uncomfortable than Pete. thanks to CJ Mackintosh and Dave Dorrell’s instrumental that turns this ode to the ladies of Brooklyn into a dance track. That said, this aint touching the original version which I happen to love. Product Of The Environment – Now when I looked at the production credits and saw that Marly Marl was responsible for this one I got a little excited (not full on wood, but just a little lift). For those of you that don’t know, or your old age has just effected your memory, Marly Marl was one of the hottest producers in the game at this point in his career (remember, he produced LL’s classic Mama Said Knock You Out the same year). So when I heard this alleged remix of the original I was a bit insulted. The only noticeable (and notable) difference in Marley’s remix from the original instrumental are the horns during the hook. Either Marly was just being lazy when he did this one or he doesn’t like white people. Either way, this sucked. Steppin’ To The A.M. – I’ll take the original, with a large fry and a sprite, please. If the Cactus Revisited were water it could best be described as lukewarm. Not hot enough to make it necessary to own, nor cold enough to make it a complete waste of time. But since it is lukewarm, you’ll spew it out and forget that it ever existed.